So, many people know i've had a long mentally battle with staying on etsy. it's mostly an ethical thing. they are not supporting real artists like they claim they do. i was so happy to find them in the beginning, but after a year and hardly being found, i decided it was time to move. here is my new shop. 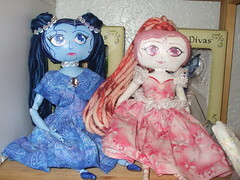 i don't have a full account yet as i've decided to move my dolls over as they expire on etsy. i will upgrade the account to a paid. i like this better actually because i can customize it. you might also notice the name change. yes, i went back to my former alias. after being Gypsy for a year and having the name tarnished by a little nag, i decided to go back to Nightengale. i'm still Gypsy, but am always going to be Nightengale. i realized the other day that it's been a year since i made my first doll, Eleanor. Casey was completed on Easter last year as my second attempt.